Blue Ivy Ready For Christmas!! Blue Ivy is sure getting ready for Christmas as she gaze at this beautiful well decorated giant Christmas tree. 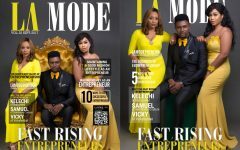 Cover Alert: La Mode Magazine September Edition! Rising Entrepreneurs Issues!